“I will never allow divisive nationalists to undermine the precious Union between the four nations of our United Kingdom.” said Theresa May. Those words and others like them have evidently resounded in the echo chambers between many a person’s ears because if the pre Brexit sentiment was bad, the post Brexit anti-Welsh/ anti-Scottish narrative has taken on a life of its own. This was Iain Dale of LBC tweeting during last week’s BBC Question Time. So is he right? Is Welsh nationalism ‘ugly’? More pertinently, is it uglier than the British Nationalism which he sought to defend when making a derisory comparison between that of our nationalism and that of the BritNat’s? On the very rare occasions when I used to think about what British nationalism meant, I would always envisage those strangely alien folk who wore union flagged suits, skipping and ringing celebratory bells while eating cucumber sandwiches when royal babies were born or alternatively, I’d picture those who held lofty, albeit confused, notions that the United Kingdom, or more specifically, England, held a special place in the world and that, by virtue of birth, this inflated their status. A jingoism which I never understood or associated with but also, one which didn’t bother me because I found it bloody comedic. Viewing it through a post Brexit lens is altogether scarier because it reveals a perverse and ugly patriotism. Pride in Britain has morphed into a xenophobia which focusses on the condemnation and segregation of non British, non white, non heterosexual people. There’s an exclusion zone which leaves many feeling disrespected, unwanted, disregarded and more, they feel frightened and unsure of their place in British life. This is a nationalism which gives some people an assumed right to swear at, spit at and abuse people in the streets. It’s a nationalism which sees ‘go home, scum’ daubed on walls. It’s a nationalism which has seen a significant rise in race and hate crimes. It’s a nationalism which describes people like me, who voted remain, as remoaners and turncoats. It’s a nationalism which affords some elements of the mainstream media a platform to insiduously encourage violence against me and the remaining 48% of people who they deem to be traitors. It’s a nationalism which harks back to what they perceive to be the great days of the Empire when (in their rose tinted view) Britain reigned supreme. It’s a retrograde punishing nationalism which pits men against men, women against women, families against families and which divides communities. The violent rhetoric and images which once belonged to the far-right are becoming increasingly normalised in a British political scene which progressively panders to the slim majority who voted leave. And with that, there’s a growing contemptuous disregard for those of us who won’t silently submit to the by now increasingly punishing result of that in-out vote, and for those who don’t fit this ‘all-British’ image of an independent UK. This is a politics based upon fear, blame, revenge, hate and persecution. Leanne Wood was right to call it ugly. Wales is stunning but as beautiful as it is, it would be disingenuous of me to paint it as Shangri-La or to try and portray our citizens as a nation of open minded, outward looking people, no reservations. There are, of course, exceptions but where they exist, they have nothing to do with Welsh Nationalism and everything to do with some unholy British allegiance. It’s no coincidence that when I read social media, the Welsh ‘leave’ voters here are generally the same people who love the queen, defend the UK, and parrot the oft repeated the ‘too small, too poor’ mantra. All too often, they are also anti Islamists. These are not Welsh nationalists; they are British nationalists living in Wales. Make of that what you will. So when Iain Dale talks about the ‘politics of Welsh nationalism’ being ugly, what does he mean and who is he talking about? Is he impying that we ‘Welsh Nats’ are guilty of acts of violence and aggression against the big boys across the border? Is he pretending, as Alun Cairns did, that we are hostile to incomers? Or is he alluding to historic acts of ‘violence’- things like the attempted bombing of Tryweryn, for example? Things which he probably hasn’t researched? Perhaps I should approach him, ask for explanations, encourage him to expose his inner Britnat and reveal how little he really knows about and understands of Wales but I bet, if pushed, he’d reveal that he actually knows very little and cares even less. When we, as Welsh nationalists, talk about our hopes for Wales, we discuss how to make our country a successful nation where we work together for everybody’s betterment, where every person who lives here has an equal chance of education, employment, prosperity, access to healthcare, opportunity and life satisfaction. It is a politics of hope, not of fear. We want the best for Wales and all who live here. And yes, we discuss independence – never more important than it is today when the alternative is shackling ourselves to a union where the rhetoric of Oswald Moseley is becoming increasing acceptable. 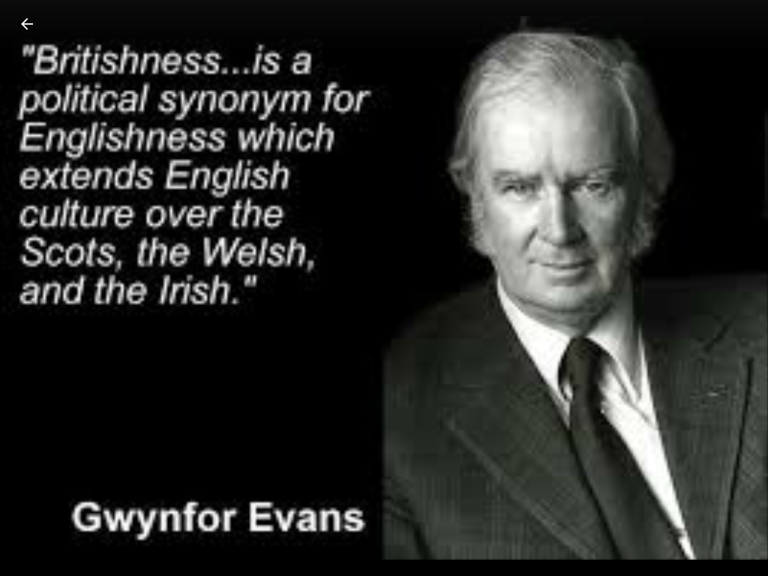 There is no ugliness in Welsh nationalism. Welsh nationalism, as it exists politically, centres around Plaid Cymru and Yes Cymru, two pacifist organisations and their aim for an independent Wales. The ugliness that he refers to is a myth perpetuated by ignoramuses who so love the dysfunctional union that is the United Kingdom, they will fabricate things in order to protect said union and will lie if it turns people against those of us who want different. Last week’s Question Time came from Neath and as such, it really was to be expected that Wales would feature large. Iain Dale didn’t like that. I don’t think he likes Wales having a voice at all, to be honest. I think the sound of our name irritates him! Perhaps he’ll be happier if Wales and England become Wengland? Perhaps Iain Dale understands that far from being ‘too small, too poor’, our depth of natural resources is so crucial to an England that dismisses us, our independence would have dire consequences to those who take said resources for granted? Perhaps, when Iain Dale and people like him talk about our ‘political ugliness’, what he really means is our ‘political existence’? I suspect that, in his mind, we are ugly by virtue of the fact that, despite what the English government has thrown at us, we are still here. As we’ve been, so we remain. Yma o hyd. who is this cnut Ian Dale – not really all that significant in any way ! Pay no heed ,he probably dines out with banksters and other spivs who feel they have some divine right to lord it over the rest of us, and has got tangled up in some crazy superiority complex. Put him out of his misery, soon.